I’m happy to announce the availability of Syntaro Version 1803. The new Version improves the Application Management Module and allows you to better control and monitor your deployments in a modern managed Windows 10 environment with Intune. If you would like to try out our solutions, you can register your Azure AD tenant for free and use trial versions of all products. Just go to portal.syntaro.com to sign up. If we deploy Apps, it’s enough to see if the deployment works or not. But as soon you start to deploy new versions of apps, it is required to see the installed version centrally. Because of that we introduced the Version column in the Inventory. With that in place, you have now one single place to monitor the Application deployment. In the next release we will add more useful features like deployment rings, which allows us to deploy applications based on rings, without creating multiple applications in Intune. Until now, we have never updated the base Script in the packages when you changed this in the central location. 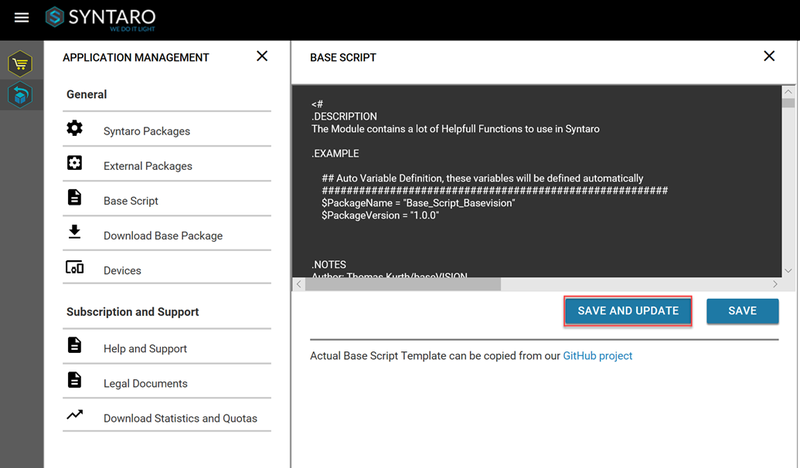 With this release we added now an option to “save and update” the script in all productive packages. We have added this functionality on customer request. Keep in mind, that this can lead to malfunctional packages, so test the script well before updating all packages. The other changes are highlighted in the Release notes and are mostly small updates, which make life simpler. If you have some Feedback, we love to get it directly. Syntaro is a Framework of Solutions, which support or close gaps in the Microsoft Intune and Windows 10 to bring the modern workplace to your company. It is fully built on Azure Infrastructure.